The author of Gold Wars reviewed in last month’s issue replies and we discuss capitalism, banking, economic crises and money with him and come to similar conclusions. Kelly Mitchell: DAP’s review in the Socialist Standard’ of my book Gold Wars is much appreciated. The review quite rightly pointed out a few errors in the book, especially regarding the phrasing I chose. First, it’s correct that negative economic cycles occur under a loosely defined ‘gold standard’. I should have written that they tend to be more muted because sound money has a negative feedback effect on speculative frenzies. However, under a strict gold-backed system, a bank run is not possible, because any currency issued would have proper backing. When such crises happened (and I cover several in the book) the banks were not practicing a true gold standard. They were practicing a fractional reserve gold standard. In other words, there has been no genuine gold standard of fully-backed money for hundreds of years. My fundamental concern is that socialists and others who sincerely want a better world can do nothing if they fail to properly understand the world we are in. The banking system is needlessly and deliberately opaque. This ‘fog of war’ exists to confuse and bore people. The creation of money is an essential topic for those who object to the capitalist system. You must know how it favours the powers that be. Those who control the supply of money have tilted the deck to assure the increase of elite power. Democracy has become a mere facade, with powerless voting placating the masses while monetary creation dictates all government action. Anyone who considers this a false ‘conspiracy theory’ is woefully ignorant of the nature and manifestation of power in the current capital dominated world. 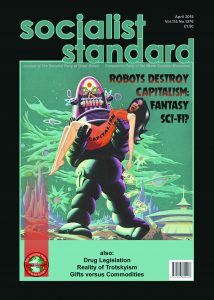 Socialist Standard: The real issue is whether reforming the monetary system in some way will solve the problems of the market. We’ve seen nothing (and certainly no evidence) to suggest this is the case. In fact, world capitalism throughout its history has produced a long list of monetary reformers of various sorts: advocates of both inflation and deflation, those who support a gold standard, the followers of Major Douglas and Social Credit, those who believe in abolishing interest payments – yet none of these have ever succeeded in removing the problems of the market economy, including its periodic crises and slumps. This is because the problem with capitalism is not its financial superstructure. That’s a bit like saying the problem with smallpox is only the scabs it produces – the problem is production for profit itself, the market economy, not particular features of it. Crises and slumps with their attendant unemployment and poverty are entirely normal for capitalism. They are not an aberration but the way the system rids itself of inefficient units of production so it can expand further in future. KM: The review says ‘Mitchell repeats some of the myths about the power of the banks to create massive multiples of credit out of nothing’. This comment is quite puzzling to me. The author fails to specify which ‘myths’ he means. Is it possible for the Central Bank to create as much money as they wish or not? If not, what possible real world constraint exists? There are technical restrictions on fractional reserve lending, but as I detail in the book, these do not apply in all countries, nor do they apply to the shadow banking system. SS: Hopefully you will forgive us if we do not again go into the issue here of why commercial banks can’t create near endless amounts of credit from a given deposit base. 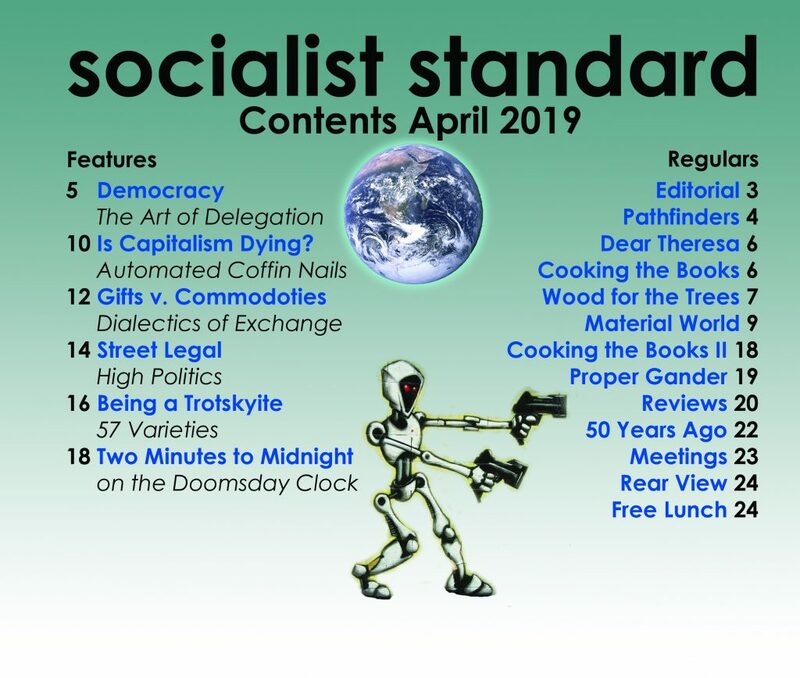 We have spent much time on this in recent years already – we refer him to the issue of the Socialist Standard in October 2012 as an example of where this was dealt with in several articles and in quite some depth. Most gold suppression theorists are fiercely capitalist, with a bizarre faith in something called the free market. I hold that such an animal is like a griffin – it does not exist, nor can it because of a fundamental contradiction. In a completely free market, the government (and regulations) would be simply another commodity to be purchased by those with money. Regulations would arise to punish smaller competitors, destroying any free market. Contrariwise, to prevent that situation would require stopping companies from purchasing desired regulations – but that would be an interference in the free market, as well. Hence, no free market is possible. SS: You are right that your book didn’t explicitly advocate a gold standard, but it is certainly implicit throughout, hence the reason we said Mitchell ‘seems to be part of this group’ of theorists. It also emerges that your definition of a gold standard is rather different to the conventional one, though our point about booms and busts happening when currency is convertible into gold still stands. The idea of capitalism being able to generate sufficient capital flows and liquidity in a system where all currency is either gold itself or 100 percent backed by gold at all times is truly fantastical – indeed, it has never happened. It is no more likely than capitalism without bank deposits, credit and interest, as these all help propel the mass circulation of commodities in world markets, the levels of labour productivity associated with this, and necessary flows of capital investment. You rightly point out that the pure free-market beloved of the Austrian school of economists is a myth but so is capitalism without conventional banking and the paraphernalia that goes with it. For the record, the article was written about a fortnight before it emerged Barclays had been fined for the part played by an alleged ‘rogue trader’ of gold in their dealing rooms. It has also recently come to light that under pressure from the financial authorities in Germany, Deutsche Bank has now left the gold fix syndicate completely. So the ‘fix’ is set to change dramatically under pressure from governments. If there has been a conspiracy (or collusion) to manipulate the price of gold, it is comparatively peripheral to the operation and survival of capitalism and something governments can and will deal with when necessary. In many ways this is just as they periodically deal with the effects of other cartels that get in the way of the wider interests of the owning class. KM: The review continues ‘Mitchell has failed to understand that the expansion and contraction of the credit system that he is fixated on, and its attendant asset bubbles, is a reflection of the underlying trade cycle of the market economy and is not its cause. This instead is the drive by firms to sell commodities at a profit as if the demand for them is unlimited, leading to over-expansion of the booming sectors of the economy. This overproduction leads to cut-backs, hoarding and lay-offs and the monetary and credit systems are what transmits these effects throughout the economy more widely.’ The author makes a common analytical mistake. He believes such cycles have only a single possible cause. He also ignores the positive feedback mechanism wherein the effect and the cause reinforce each other. He is correct that expansion and contraction are normal parts of the business cycle – I never claimed otherwise. I contend that gross expansion of the money supply leads to ‘sloshing liquidity’ and out of control mal-investment. The over-expansion of certain sectors is hugely exacerbated by excess money printing and so-called ‘hot money’ flows. The impossibly high valuations of the real estate market would never have occurred under a gold standard. They happened because banks were lending Other People’s Money and cheaply created money to anyone with a pulse. As evidence, the only group pointing out the crisis beforehand (and they were correct) were the Austrian school – most of whom agree with my fundamental thesis of gold market manipulation with the intent of maintaining the currency monopoly. ‘[A]s the US housing market falters, more sub-prime loans are going bad . . . The bursting of America’s housing bubble could have widespread impacts on US financial institutions and others who have exposure there . . . the entire housing bubble phenomenon is wider than commonly supposed – while the US and UK economies have a particular problem with their housing markets, so do many other countries where identifiable bubbles also exist, from Ireland and Spain to New Zealand . . . When the crash comes, it will return markets to more realistic levels that are more in line with real incomes and values, and this is what has happened on every other previous occasion’. (‘Forever Blowing Bubbles’, Socialist Standard, May 2007). This was published several months before the crisis broke and a full 18 months before the Lehman Brothers implosion. It was an analysis using Marxian economics as a tool for understanding how capitalism works – one that leads socialists to recognise the inherent dynamic of the market economy as being the problem not part of the solution (unlike the ‘laissez-faire’ Austrian school of economics whose advocates want even more market madness, red in tooth and claw). KM: I quite agree with the review that all monetary systems, whether gold backed or fiat, lead to concentration of power in the hands of the few at the expense of the many. My book is solely descriptive of the shape that concentration has taken since the abolition of any gold convertibility in 1971. My fondest desire is for the abolition of money altogether and for completely shared resources by all humanity. You can call it socialism, communism, the gift economy, or whatever you like – the name is irrelevant. It would vastly increase the lifestyle for everyone (even the rich) and lower the drain on earth’s resources because most goods would not sit idle – they would be common property. Further, it would end the odious cycle of converting genuine resources into wilfully obsolete garbage for profit. Goods would be durable and engineers would take pride in that. The most common crime – property theft – would no longer exist. It would be a better world. In fact, the original book concluded with a lengthy critique of capitalism and a prescription – the Resource Based Economy – for a fully equitable system. SS: A book, of course, can only be reviewed on the basis of what it says. It is genuinely pleasing to see you agree that the only real solution to the problems caused by capitalism is the establishment of a society of common ownership and production for use where the market has been abolished. The trouble is that you would never know this from reading your book. In its 256 pages there is not a single reference to any of this. If there had been the book would have received a rather different review from us. Instead we have a book which ends by saying that in the ‘gold wars’ to come ‘the best ammunition is gold’. Not much of an option for the wage and salary earners who make up the working class majority in society. We feel you have a choice to make. Either you continue to advocate the case for gold (whatever precisely that may be) or you advocate the case for socialism. We suspect that you now realise you wrote a book making the case for the former (possibly encouraged by your publishers), while coming to the conclusion that the latter is the real and lasting solution to the chaos of the market. Not ‘sound money’ but ‘no money’ if you will. We invite you to think seriously about this and join us in spreading the idea of a sustainable, human-centered alternative to capitalism. That is, one where markets and prices have been replaced by production directly geared to satisfying people’s needs and desires.